The Grand Mass Gymnastics and Artistic Performance Arirang (Chosŏn'gŭl: 아리랑 축제), also known as the Arirang Mass Games, or the Arirang Festival was a mass gymnastics and artistic festival held in the Rungrado May Day Stadium in Pyongyang, North Korea. The games usually took place in August or September. The games were held annually between 2002 and 2013, with the exception of 2006. After a five-year hiatus, mass games returned under the rubric The Glorious Country in 2018. According to the Russian News Agency "TASS", "Arirang is a gymnastics and artistic festival, known as mass games. The extravaganza unfolds an epic story of how the Arirang nation of Korea, a country of morning calm, in the Orient put an end to the history of distress and rose as a dignified nation with the song 'Arirang'. The Arirang performance has been included in the Guinness Book of Records." The name refers to "Arirang", a Korean folk story about a young couple who are torn apart by an evil landlord, here intended to represent the division of Korea. The festival was held annually between 2002 and 2013, with the exception of 2006. The mass games were not held in 2014, 2015, 2016, and 2017. In recent years, foreign tourists have been allowed to watch one of the many performances. The mass games returned after a five-year hiatus, taking place from 9 September through 30 September 2018. The new installment is called The Glorious Country (빛나는 조국). The Mass Games possess an important ideological character praising the Workers' Party of Korea, its armed forces, Kim Il-sung and Kim Jong-il. These messages may not be clear to foreign spectators, who are not aware of North Korean iconography: a rising sun symbolizes Kim Il-sung. When a gun is shown, it signifies the gun which Kim Il-sung gave to his son Kim Jong-il. The colour red, particularly in flowers, stands for the working class, and the colour purple and red flowers represent Kim Il-sung (as the flower Kimilsungia is a purple orchid and the flower Kimjongilia is a red begonia). A snowy mountain with a lake represents Mount Paektu, where Kim Jong-il is said to have been born in a log cabin. The Korean People's Army Marching Band at the festival in August 2013. The opening event of the two-month festival are the mass games, which are famed for the huge mosaic pictures created by more than 30,000 well-trained and disciplined school children, each holding up coloured cards, in an event known in the West as a card stunt, accompanied by complex and highly choreographed group routines performed by tens of thousands of gymnasts and dancers. 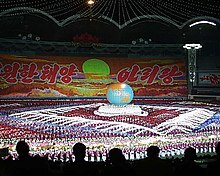 In August 2007, the Arirang Mass Games were recognised by Guinness World Records as the largest gymnastic display with 100,090 participants at the May Day Stadium in Pyongyang. ^ Jung, Hyang Jin. "Jucheism as an Apotheosis of the Family: The Case of the Arirang Festival." Journal of Korean Religions 4.2 (2013): 93–122. ^ "DPRK prepares for celebration of victory in the 1950–1953 war under rain". Russian News Agency "TASS". Retrieved 16 March 2015. ^ Leo Byrne (6 February 2014). "No Arirang Mass Games this year". NK News. Retrieved 6 February 2014. ^ "North Korea halts showcase mass games due to flood". Reuters. 27 August 2007. ^ "The Mass Games are confirmed". Uri Tours. July 7, 2018. ^ "human billboard paintings at north korea mass games". Design Boom. Retrieved 9 December 2012. ^ Watts, Jonathan (1 October 2005). "Welcome to the strangest show on earth". The Guardian. "Interview with Song Sok Hwan, Vice Cultural Minister: Re-extended 'Arirang' Performance Is Intended to Give Fresh Impetus to Economic Renovation in DPRK". The People's Korea. 13 July 2002. Archived from the original on 12 August 2003. Retrieved 22 October 2018. Kim Jong-il (August 15, 2002). The Grand Mass Gymnastics and Artistic Performance Arirang is a World-class Masterpiece Representative of the New Century (PDF). Pyongyang: Foreign Languages Publishing House. Song Mo Kim; Song Il Thak; Chol Man Kim (2002). Mass Gymnastics in Korea. Pyongyang: Foreign Languages Publishing House. OCLC 499981837. Archived from the original on 2017-08-12. Wikimedia Commons has media related to Arirang Mass Games. This page was last edited on 5 November 2018, at 01:57 (UTC).